See this is what happens when you see the authors name and the narrators name and you go gimme' I want that...you end up reading a Christmas story. There was a lot about this story that I enjoyed. First off we've got a high school music teacher who wears bow ties...sorry, my high school music teacher wore bow ties and I have to admit he was really nice...not exactly a hottie...although he did have two sons...oops, sorry I squirreled back to the story. Bowen also has a rare condition known as Chromesthesia, a form of synesthesia in which sounds are translated to colors by the mind and for Bowen it also contributed to his ability to have perfect pitch. Bowen Merlin has accepted a position teaching music in Lancaster, New Hampshire. So he's packed up his life in New York leaving behind his best friend and roommate, Rachel and heads for the beautiful New England countryside. Where he quickly learns that he's not only teaching music but with only a two or three weeks to go before the holidays he's also got a Christmas concert to organize and life quickly becomes busy but not to busy to keep him from noticing the Felix Hansen, owner of Snowy Ridge Apple Orchard. Neither of these men are what they appear to be but what Bowen quickly realizes is that what they are is a match made in heaven. While most people wouldn't realize it Bowen likes to be the one in charge, while Felix...well, he's more than happy to relinquish control...or at least he would if he could just trust someone enough. Felix has scars and they're not all on the outside but Bowen's determined to show Felix that what they could have together is worth taking a risk. I really liked Bowen. His upbeat and quietly determined personality was just what Felix needed. Felix's past hasn't been good. He's been hurt by the person he loves. The person he should have been able to trust above all else but they failed him. As if there isn't enough going on Felix and Bowen suddenly find themselves embroiled in events that could not only tear them apart but ruin them both professionally as well. I honestly would have gotten more into this part of the story if it had been introduced a bit sooner and the resolution hadn't occurred quite so readily and easily. Overall, I enjoyed this story and events moved at a steady pace from start to finish but I did feel a little let down by the resolution at the end, it just all seemed a little to quick and easy, but in spite of this I was left having a very enjoyable 6+ hour listening event thanks to the as always wonderful audio narrations of Greg Boudreaux. So maybe this wasn't totally a 4 star read...I don't know but it was definitely a 4 star listen. 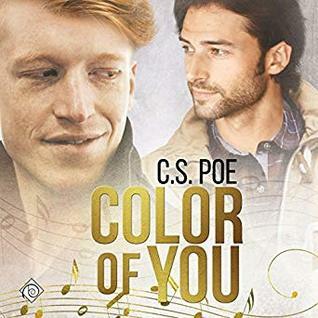 An audio book of 'Color of You' was graciously provided by the publisher in exchange for an honest review.